This Allard is quite unique. It’s an Allard Safari, essentially it’s an Estate (wagon) version of the P2. The P2 Safari, Monte Carlo, and K3 all carried essentially the same style of tube frame chassis with a J2X style split axle front suspension and DeDion rear end. The tube frame chassis was considerably stiffer than the formed channel chassis of the J2X. The car also features a left hand drive setup (the only Safari so configured) and an automatic transmission. 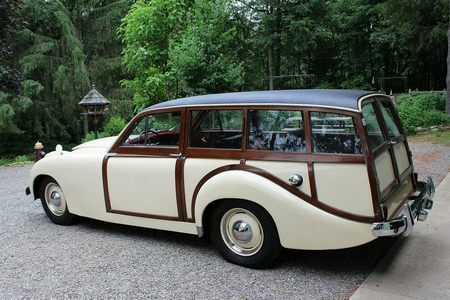 Coupled with the 5.4 Liter Lincoln 368 V8, this was likely one of the most potent 50’s era wagons on the planet. This car is chassis 4513, the thirteenth and last of the Safari’s built. This car was displayed at the 1955 Earl’s Court. The original owner, Dr. Elkingpon purchased the car some 2 years after it was built. He had it delivered to Vancouver Canada; and soon decided that he didn’t like how the front clip tilted up. This led him to commission a regular front end so he could have a bonnet…which really makes this Safari a one of a kind. The Car was sold after 10 years to the Wells family. Norman Scott purchased the car in 1989, followed by the current owner Doug Quantz. The car was brought to the Monterey Historics in 1990 (Allard was the featured marque), where it was presumed a fake due to the front end. That’s when Allard engineer; Dudley Hume remembered transporting the car from the factory to Liverpool for shipment to Vancouver. The asking price for this very rare and unique Allard is a reasonable $52,000 (US). If interested, please click here to contact the owner. Click here or the photo above to view the extensive photo gallery. PS: Did we mention it's a woodie?